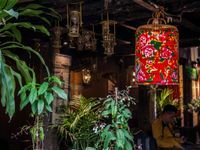 Inside, you’ll find the archetypal fare of trendy hangouts: filament lighting glows out of latticework bamboo lamps, red floral fabric hangs around empty bird cages and green-painted wooden shutters line the back wall. 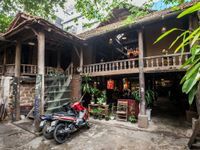 But what separates Nha San Cafe from many others throughout Hanoi is not just this timeworn building, but also its status as an art space. The stilt-house once formed the studio space of contemporary art group Nha San Collective and, while the café now operates under new ownership, they still frequently host concerts and events here. In fact, as I visit, there is an impromptu jam session between two young men. Out of tune, but full of heart. Yet Nha San takes its role as an art space seriously. 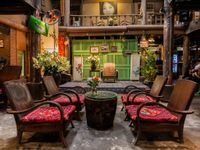 There is astute attention to detail; incense sticks create a soft, calming atmosphere, while hard wooden chairs remind you of a Vietnamese grandma’s house. The walls are all adorned with artwork. Some are abstract, some are political, although the most striking is a monochrome portrait of a Vietnamese girl overlooking the lower floors. The layout is one of the spots most interesting elements, yet is typical of this particular genre of architecture. The upper deck, accessed via several rickety stairs, skirts around the outer edges, leaving a large open space in the center and creating an airiness you’re unlikely to find in other hip establishments. While the very young customer base, coupled with the onset of a cà phê sữa đá-induced panic attack did nothing but remind me of my own mortality, in general, the surroundings, and coffee, were pleasing. 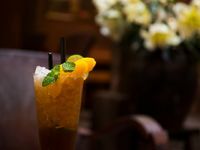 When it comes to drinks, however, you won’t find anything wildly unique on their handwritten menus. Avid followers of Urbanist Hanoi, or anyone up to date with their art space news, will probably be aware of the recent closure of Sixty Square. The building, which made its home in a former post office, had gathered a youthful following, led by young adults working together a mish-mash of interests and countercultures. There is a hope that such outlets for young, creative communities in Hanoi can remain. At the risk of sounding nostalgic for a past that I have no right to feel nostalgic about, I’ll conclude by saying that, sadly, only time will tell. The hope is, due to just how impossibly hard it is to find, the same will not happen to Café Nha San. Cafe Nha San is open from 8am until 10pm. Find them on the curved alley heading south from Ngo 6 Vinh Phuc.